Laurel Book Store has been an important venue for community events since its launch in 2001, and is well known for its selection of independent and locally published books. 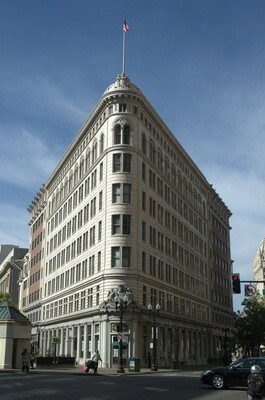 However, the store recently announced a move from its namesake district to a larger space in downtown Oakland. The bookstore will keep its name — owner Luann Stauss credits her friends and customers in the Laurel district as the reason for the store’s growth. The new space is expected to open in October, at about the same time as the business’ thirteenth anniversary. The bookstore also has launched an Indiegogo crowd-funding campaign that will run through September 24 with a goal of raising $50,000 for the move. The Lionel J, Wilson Building. The new location will be across from Oakland City Hall in the flatiron Lionel J. Wilson Building (formerly the First National Bank Building) at 1423 Broadway, joining cultural hubs in the area such as Pro Arts, Awaken Cafe, and the Fox Theater. In an online letter to her customers, Stauss expressed both her gratitude to the store’s supporters and her hopes to preserve that loyalty at the new location. One of the reasons for the move was to obtain a larger space for in-store events – Stauss said she never thought she’d stay in the 900-square-foot space in the Laurel district for thirteen years. The bookstore will use the crowd-funding campaign funds to help pay for moving-related expenses, furnishings, new inventory, and an updated electronic point-of-sale system. The project uses Flexible Funding, meaning that Laurel Book Store will receive all donations, even if the end goal of $50,000 is not met. Perks for donors include discounts, gift items such as Laurel Book Store tote bags, and even a shelf in the store to offer personal book recommendations. In addition to the store’s own investment in the new site, the store has received a small business loan and financial contributions from the City of Oakland. Over the past year, independent bookstores have been making a resurgence in Oakland, as the Express noted in its recent cover story, “Books Are Dead. Long Live Books.” Stauss is also arranging for neighboring businesses in the Laurel to take over services that the bookstore has offered, such as receiving packages for local residents.